PIOMAS ice thickness and volume results have undergone substantial validation via comparison with ice thickness data from submarines, moorings, airborne electromagnetic induction (EM) measurements and ice thickness retrievals from ICESat. In addition, model sensitivity studies were conducted to assess the impact of model parameters on ice volume anomaly trends. It is difficult to validate total Arctic sea ice volume directly. There are no true measurements of total ice volume that can be compared to model-derived estimates. Validation is best achieved through a comparison with in situ and satellite-derived ice thickness observations. The observations used here are collected at the Unified Sea Ice Thickness Climate Data Record. We can also try to estimate how much the model-derived volume and trends change when we change model parameters that are not well know. 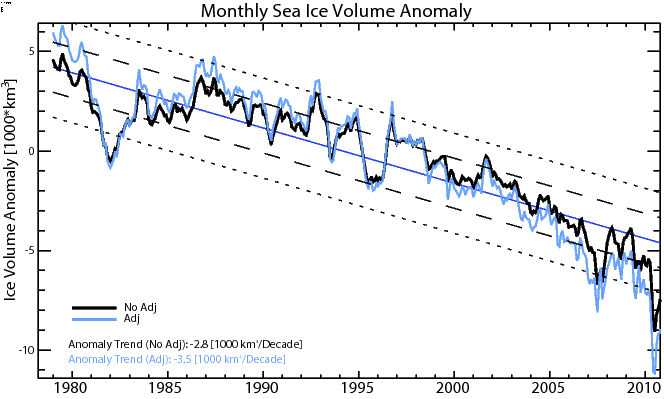 The combination of this allows us to make estimates of the uncertainty in the ice volume and trends from PIOMAS. Top Left: Location of in situ observations from 1975-2010 (top left). 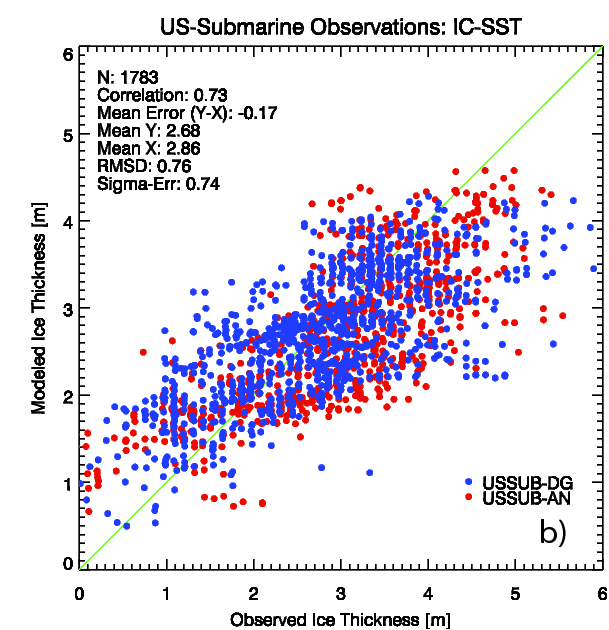 Top Right: Comparison of in situ ice thickness data from US submarines. Red dots are from analog recording systems. Blue dots are from digital recording systems . Data from US submarines were used in the development of PIOMAS and are therefore not independent. Bottom Left: Comparison of PIOMAS ice thickness with data from sites that were not used in the development of PIOMAS and are therefore independent. The RMS difference for both comparisons is 0.78 m.
Because total Arctic sea ice volume from PIOMAS is computed as an average over many grid points, the random error (scatter in above figures) doesn’t affect the uncertainty in the total ice volume and trend very much. Much more important are systematic errors. Note that from the comparison with in situ observations it appears that PIOMAS tends to overestimate thin ice and underestimates thick ice. As the ice thins such systematic errors can affect the overall trend. An additional complication is that in situ observations themselves are not perfect and may have systematic errors. Most in situ measurements are based on sonar, which uses the first return from the sound that bounces off the bottom of the ice. The creates a bias in the estimate that is small when the ice is smooth and worse if the ice is rough. Because thick ice is often very rough, ice thickness estimates from in situ measurements may actually be biased higher for thick ice than for thin. It is therefore not totally clear whether the fact that PIOMAS tends to underestimate thick ice is a model or a data problem. Not being able to answer this question definitively at this point, we can still ask the question: what if all of the error comes from the model? How would that affect the time series and the trend? To do this, we simply develop a linear relationship based on the above comparison with in situ observations and compute an adjusted ice thickness for all locations and times: hadj=a+b*h. Averaging hadj over all grid points we can generate an adjusted ice volume time series. To be sure, this is not meat to create a “better” ice volume estimate but rather to test the sensitivity of the ice volume trend to potential systematic errors in the model estimates. The figure below shows the original and the adjusted ice volume anomalies. Original and adjusted (to in situ observation) ice volume anomalies. The downward trend increases from -2.8 103 to -3.5 103 km3 / decade. Based on comparison with in situ data, it appears that our ice volume trend estimate from PIOMAS is likely a conservative estimate of the real ice volume loss. The change in the trend is nearly 30%, underlying the need for further work to narrow model and in situ observation differences. There is little doubt that both observed and modeled trends are strongly downward. 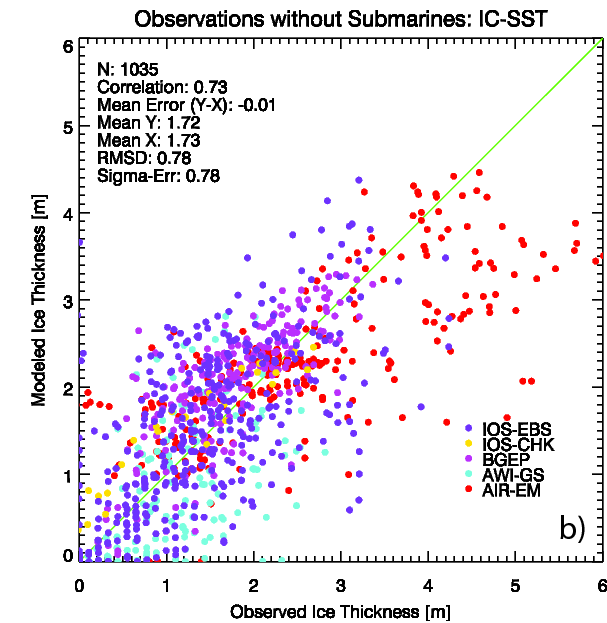 Comparison of PIOMAS ice volume estimates with a time series constructed from in situ submarine observations and ICEsat estimates from Kwok and Rothrock (2009) based on prior work by Rothrock et al (2008) that focused only on the submarine data. 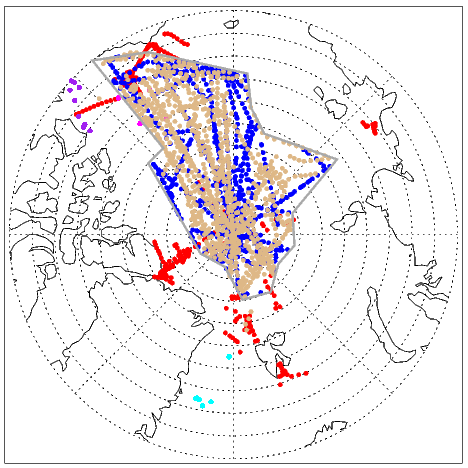 in situ observations are scattered in time and space while ice thickness also varies strongly by time and location. It is therefore very difficult to establish such a time series from observations. Rothrock et al. 2009 used higher order polynomial regression model to interpolate in situ data in space and time. This time series is for October/November Average over the Data Release Area, the area from which US Submarine data are available. 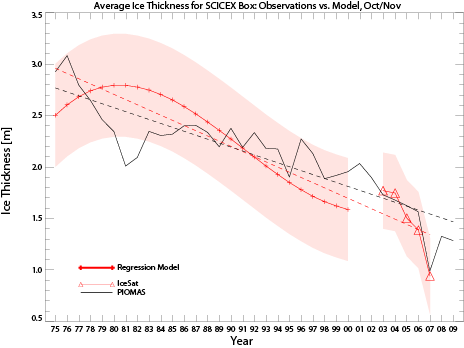 The shaded area corresponds to the error estimate for in situ/satellite time series. Except for a period in the early 1980ies PIOMAS agrees well with this time series.